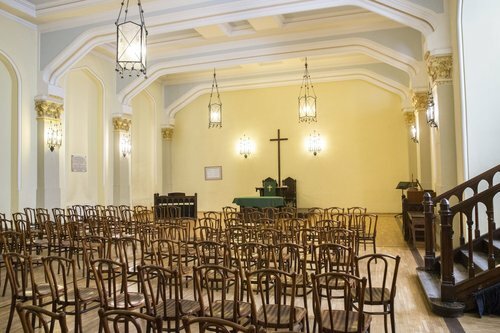 The Scottish Mission in Budapest has a long and rich history in the city. 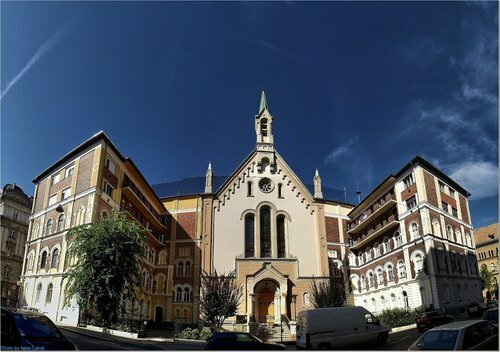 Since it's founding in 1841, the Mission has formed connections and relationships with people all over Budapest. This map highlights just a few of the connections that have been so important throughout the years, including churches that have been started with the help of the Mission; an embankment named in honor of Jane Haining, a Scottish Matron at the Mission School; and a picturesque bridge in the heart of the city that was built by Scots. 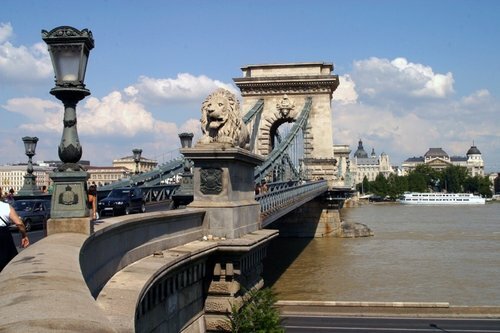 It was the first permanent bridge across the Danube in Hungary, and was opened in 1849. The bridge was designed by the English engineer William Tierney Clark in 1839, following an initiative by the influential Count István Széchenyi, with construction supervised locally by Scottish engineer Adam Clark. In 1841, when Rev. John “Rabbi” Duncan, the first missionary, arrived in Budapest, he recognized the spiritual needs of English and Scottish labourers working on the construction of the Chain Bridge and their families, and he gathers them into a congregation. In June 2010, the Municipality of Budapest made a decision according to which parts of the lower embankment of the Danube river in Budapest would be named after martyrs and persons who rescued Jews during the second World War. 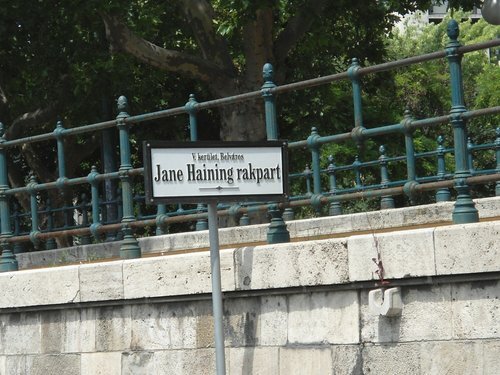 In this way of commemoration, the section of the embankment between the Chain Bridge and Elizabeth Bridge was named after Jane Haining. 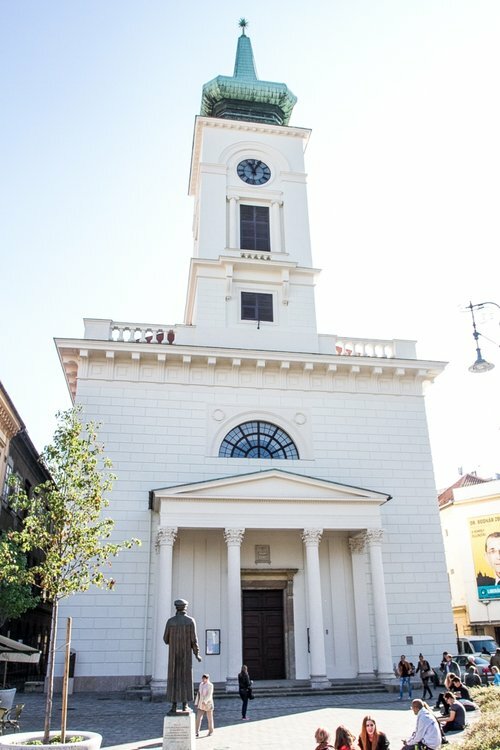 This was the first Reformed church in Pest and the mother church of the German–speaking Affiliated Congregation since its foundation. Officially the Scottish missionaries worked has associate pastors to the minister of the Pest Reformed Church in Széna Square (Hay Market). In 1874, the square was renamed after the great reformer, John Calvin, whose statue stands in front of the church. The statue was created by Barna Búza in 2000, for the 4th World Gathering of Hungarian Reformed people. Today the church is Budapest’s biggest reformed church and the second biggest protestant church. It is also famous for its monumental organ. An Affiliated German Speaking Reformed Church was established in 1860s which soon became the hub of Evangelical-Pietist revivalism. It was started with the help of the Scottish Missionaries with the aim of carrying out diaconal work on a biblical basis. 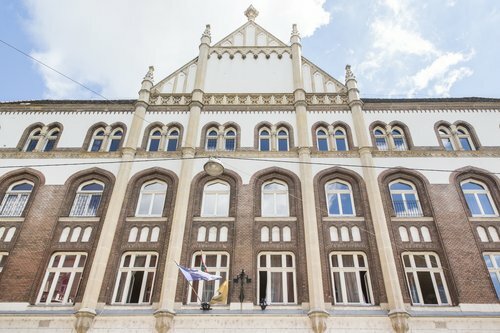 At the beginning, the German-speaking Church used the school’s assembly hall for public service, and in this way the congregation became an integral part of the Mission, representing major progress towards the Mission’s goal of establishing a relationship with the Reformed Church of Hungary. 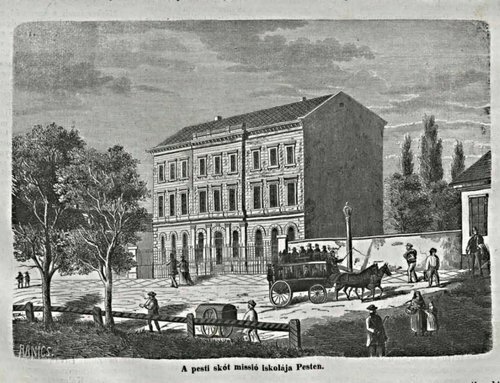 In 1863 the congregation became independent from the Pest Church in Széna Square and in 1878 the new church building could be opened in the Hold Street. 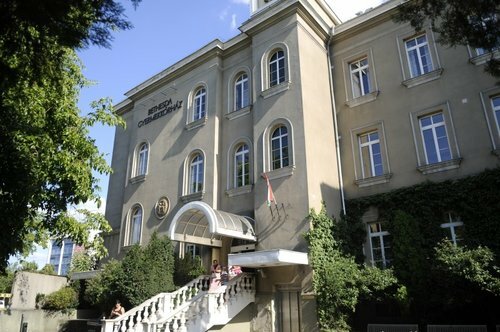 The Bethesda Children’s Hospital in Budapest is one of the oldest children’s hospitals in Europe, and it is the only Christian children’s hospital in East-Central Europe. The Bethesda Hospital was established 150 years ago. At the beginning, the hospital was maintained by the German-speaking Affiliated Congregation, which was established by the help of the Scottish missionaries with the aim of carrying out diaconal work on biblical basis. Today the Bethesda Hospital belongs to the Reformed Church in Hungary. 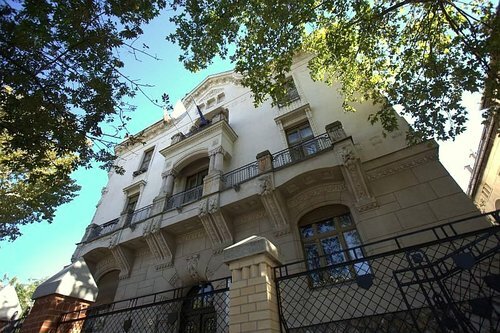 In 1910 a girls’ school was built on Vörösmarty Street with Jewish and Christian girls living and learning together. The Mission was known for its religious tolerance and high standards. During the second World War, the school was initially sheltered Jewish refugees, but was eventually evacuated and for a time, the Arrow Cross Party used the gymnasium to detain prisoners. In 1946 the education re-started in the building and two years later it was nationalized. Today, despite not being a church-run institution, the school identifies with the motto of the Scottish Mission: “How to do good?”. Today, the left-side entrance of the building complex of the former Mission School belongs to St. Columba’s Scottish Congregation. The sanctuary, called Webster Hall, was named in 1935 after the former Scottish missionary. Although the doors in the entrance corridor and Webster Hall have been walled up and today we talk about two separated buildings, there is still a sense of connection between the congregation and the staff members and students of the school. The church building consists of the Bible Study room named after David Walker, a Sunday School room besides the sanctuary, and office spaces in what used to be a gallery. The building keeps the memory of Jane Haining alive. In 1982 Moderator of General Assembly visited Budapest and unveiled a marble plaque. The Right Revd. Dr. Andrew Doig, presented a pulpit Bible dedicated to the memory of Jane Haining and unveiled a marble plaque in the church. In 1984, to mark the fortieth anniversary of her martyrdom, the Jewish community in Budapest erected a marble plaque in the Mission to commemorate her life and witness. The St Columba’s Church believes in hospitality and mission, and that honouring the heritage of the building means allowing a variety of groups to use the space. Besides the congregation the bulding accommodates other groups, such as the Kalunba Charity Group assisting refugees, the Sofar Messianic Jewish Community, the Russian-speaking Church of the Living God, and a Bible Study group of the Hungarian Reformed Fasor Congregation. 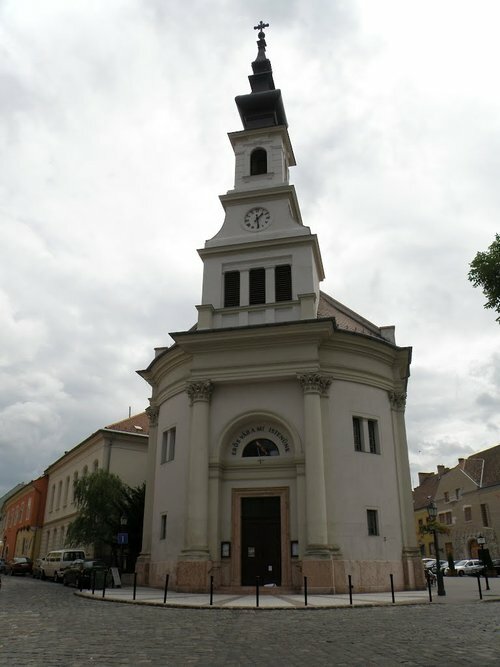 The Lutheran Church of Budavár is the oldest Lutheran church of Buda. It was built in 1895 at Bécsi kapu tér in the 1st district of Budapest. The first church for the Lutherans of Buda was built by the joint effort of Archduchess Maria Dorothea and the Scottish missionaries. The third wife of Palatine Joseph used her position to supported and protect the Scottish Mission in Budapest and its missionaries. John Duncan in his second letter to the Jewish Committee spoke of the possibility of foundation a church building for the Lutherans and asked for collection for this purpose, which was later granted. The original church building was built in 1846 at Dísz tér. Because the Ministry of Defence needed the territory, there was a site change and the new church was built near Bécsi kapu. The Great Synagogue is a historical building in Erzsébetváros, the 7th district of Budapest, Hungary. It is the largest synagogue in Europe and one of the largest in the world. In the Jewish Museum attached to the Synagogue there is a memorial to Jane Haining, the Scottish matron of the Mission School who was arrested by the Gestapo and taken to Auschwitz. 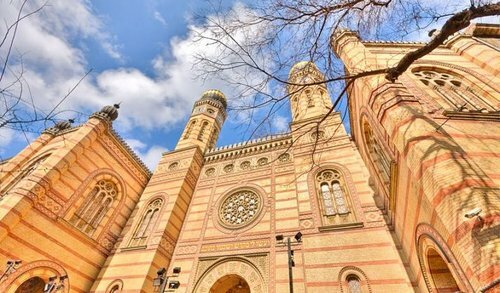 The Dohány Street Synagogue complex consists of the Great Synagogue, the Heroes' Temple, the graveyard, the Memorial and the Jewish Museum, which was built on the site on which Theodore Herzl's house of birth stood. Dohány Street itself, a leafy street in the city center, carries strong Holocaust connotations as it constituted the border of the Budapest Ghetto. The original Mission was in the neighbourhood of the Parliament. In 1868, a plot of land was purchased at Hold Street 17, where a permanent school could be built to replace classrooms used on an ad hoc basis. After the mission grew, its leadership decided to move from this governmental district to the residential neighbourhood of Vörösmarty. Since 2002 there is a new arrangement for how Church of Scotland (CofS) and Reformed Church in Hungary (RCH) ministers serve together in the Scottish Mission, which is a common congregation of the two churches. The Minister is sent by the CofS and the RCH Presiding Bishop appoints the associate minister to the congregation and. Having ministers from both churches recognises 175 unbroken years of partnership in mission, allows the congregation to maintain ties with both churches, and provides necessary stability whenever one of the positions is vacant. In 2016 the RCH Synod recognized the congregation and it is now officially integrated in both churches.